Autism Spectrum Disorder (ASD) is getting its long overdue moment in the spotlight. With a return to the West End of multi-award winning The Curious Incident of the Dog in the Night-Time, and other, smaller, Off-West End works, Alex Oates’ All in a Row is part of an ever-growing and welcome trend. With a small cast, the action takes place in the modest kitchen-living room of dysfunctional husband and wife Tam (Charlie Brooks) and Martin (Simon Lipkin), as they struggle to care for their severely autistic and non-verbal child, Laurence. Also in the equation is Laurence’s carer of two years, Gary (Michael Fox), who is both a blessing but also a constant reminder of the couple’s own failings as parents. The play has received a barrage of negative press for its representation of Laurence as a puppet, handled by Huge Purves. The National Autistic Society has criticised the choice on the grounds that it creates a dehumanising effect. In a rare sight at the theatre, press night saw protestors standing outside distributing leaflets supporting The National Autistic Society’s perspective and claiming that over 12,000 people have signed a petition challenging the show’s integrity. 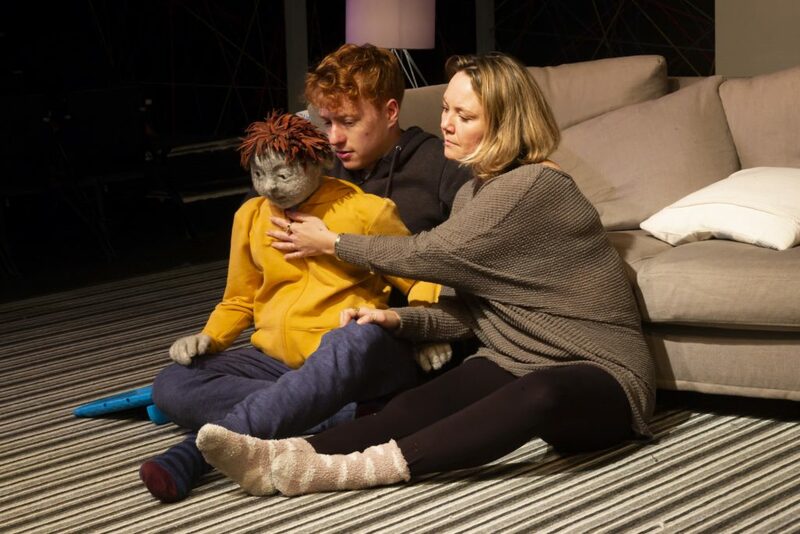 In a statement, Southwark Theatre’s Artistic Director, Chris Smyrnios, defends the writer and creative team’s choices stating that the “adult themes and desire to honestly depict the challenges of caring for someone with Laurence’s particular behaviour and needs, meant portraying a certain physicality that would be unsafe for a child performer.” Whether or not the casting of a puppet in the role of Laurence was a misjudged artistic endeavour or was for child protection reasons, individuals will come to their own conclusions about how effective it is in telling the story. The writing is informative and climactic but problematic, in as much as it feels overly forceful in what it is trying to communicate. Likewise, there are moments of humour that feel misplaced, a bit cheap and overly male centric. The jokes detract from the point at hand and can be uncomfortable. The unit set (PJ McEvoy) is literal but functional in supporting the story. A bit predictable for a play about autism, the kitchen-living room is made up of varying shapes and lines: the tiles on the kitchen floor, the rectangles of the kitchen cupboards, the lines on the carpet and the zigzags of coloured string that helps to create a structure of walkways. Whether the married couple have decorated their apartment in this way to support their son, or whether it is an aesthetic intended to ‘educate’ the audience, is unclear. Directed by Dominic Shaw, there are problems with acting technique, levels and characterisation. From gratuitous action during the pre-set to one dimensional portrayals of character, more work is needed to make Tam and Martin more rounded, so that they are not constantly shouting, banging and talking at lightning speed. Brooks and Lipkin play their respective characters as overly manic, particularly Lipkin. The most natural and believable performance comes from Fox as Gary. Brooks and Lipkin struggle to play to the intimacy of the space, instead projecting and gesticulating as though they are on the stage at the Palladium: things that Shaw surely ought to have picked up in rehearsal. 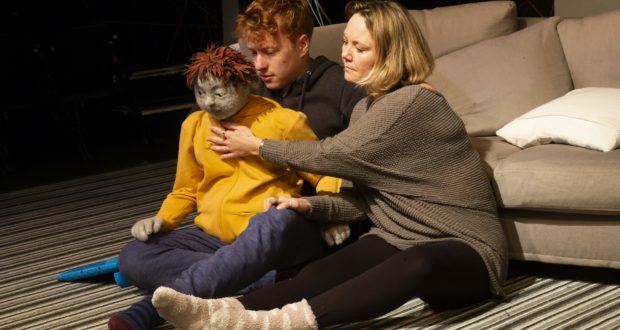 Regardless of its flaws, from the puppet to its production values, All in a Row helps to create awareness and discourse surrounding Autism Spectrum Disorder, which can only ever be a good thing. 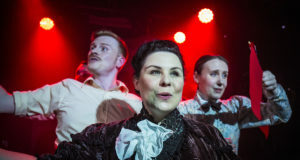 Arguably, it is because of the content that some members of the audience offered a standing ovation on press night why the production has merit (and three stars). 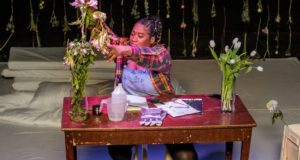 Audiences who like a kitchen-sink theatre – or who are a fan of soap opera – will probably enjoy the high drama. The bonus, of course, being that there is something we can all learn about this important issue.